Are you sure? 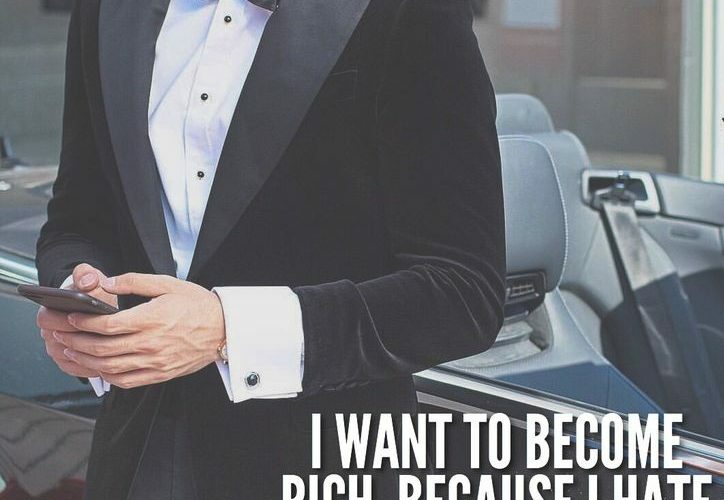 If you REALLY want to become rich, only then you will and nothing can stop you. When I was little my grandpa often advised me about the value of money. He said that merely earning money won’t make me rich, but the careful utilisation of it will. That time I didn’t understand his little nuggets of wisdom but today I realise how right he was. When it comes to money, all of us want the most of it. All of us want to be rich, but don’t know how? What do you think is the secret of getting rich? Is it access to a large bank account, innumerable properties or earning lac of rupees? What is being rich? And if you think you know what is being rich, do you also have the knowledge of how to become rich? Being rich or earning money is a mindset. Some believe that if we earn in crores we would be rich while others think that accumulating wealth and assets is the way to get rich. Are they correct? Most of us believe that being rich is out of our reach because of our limited incomes and simple means but they cannot be more wrong. Money is not limited, nor is it perishable, but we still do not understand how it works. Rhonda Byrne in her famous book, ‘The Secret’ tells us – what you think you create. What you feel you attract. What you imagine you become. This principle applies towards money and being rich too. Unless you grasp the rules of money, you cannot be rich. You need to imbibe the Top 5 Habits of Rich People, before you really earn that money because earning money isn’t as difficult as retaining it. Habit #1: Believe in yourself and your ideas sincerely, as Rhonda Byrne repeatedly stressed in her book – Believe. The secret of being rich is not only doubling your net worth, but doubling your self-worth.Believe in yourself, imaging that you can be rich and only then can you actually take the first step towards being rich. Don’t consider your problems to be a setback, take them as an opportunity and develop an idea to earn money. Habit # 2: Write down your Finances and Plan. More often than not, most of us do not list the various requirements and the funds needed for each of them. Planning ahead of time gives a large breather and helps one mentally attune to the impending expenditure. Earmark your retirement corpus, children’s education, asset creation, etc. and allocate your savings. Only planning in the mind is not enough, it needs to be penned down! Habit #3: Invest the excess money, not just save. As I said earlier, being rich is not only earning money, but retaining it and retention can only be done by wise and informed investments. While some go running after fixed deposits for investment purposes, others run after mutual funds while some others hanker to buy real estate. This is not an informed investment pattern which would make you rich. You need to build a proper asset allocation in your financial portfolio with diversified investments. Habit #4: Upgrade your own Financial Knowledge. Though most of us want to be rich, we do not know how to be rich. Financial knowledge is very essential if you want your money to dance to your tunes.Earning money is not enough, sustaining and retaining it is important if you want to climb that second step and this is possible only through financial literacy. So, investment needs to be done with calculated risks and Financial Knowledge is of utmost importance regarding the same. Like Warren Buffet says: Risk comes from not knowing what you’re doing. Learn the basics of investment yourself, so that you can best judge and then plan for the future. Investment is not only in portfolio, but also towards you. Financial knowledge is an investment you need to do for your own wealth because with the help of friends, advisers, etc. one can become rich but retaining it might become difficult. So, to increase your net-worth, you need to first increase your self-worth and then think big! Money and wealth will soon follow suit! Habit #5: Annual Review of your Financial Portfolio– Building a portfolio is not enough if you don’t be true to your investments. Follow a disciplined investment approach, check your risk profile, so a proper asset allocation, consult your financial adviser and then trust the power of compounding to work its magic and make you rich. Financial knowledge is required not only to become rich but also to remain wealthy for the generations to come. Making a financial portfolio, investing in diversified assets and sticking to the investments all require correct knowledge and dedication. Knowledge about the financial market and dedication towards disciplined investments. Following the daily stock prices, Nifty movement, Mutual Funds NAV checks, understanding real estate, knowing the interest rates of fixed deposits, etc. are required for assimilating financial knowledge on investments, which can help you generate wealth. If it looks like rocket science, seek the help of a financial planner who can guide you. Rich people do not become rich overnight. They do not do different things; they just do the same things, differently! Tell me honestly, how many of the above-mentioned points do you practice today? Even if you do not have one of the five mentioned habits, it is high time to start today!